A 40‐year‐old female patient with no significant medical history, presented with shortness of breath and chronic cough that was associated with recurrent sinusitis for a year. Physical exam showed mild tachypnea and hypoxia. Auscultation showed diffuse wheezing and basal crackles. Pulmonary function test showed obstructive pattern, for which she was diagnosed with asthma. Beta agonists and steroids inhalers were started without improvement. Chest CT scan showed tree‐in‐bud opacities (Figs. 1 and 2) throughout the lung consistent with distal bronchiolitis. Bronchoalveolar lavage showed no infection. HIV was negative. Because of persistent respiratory symptoms, open lung biopsy (Fig. 2) was performed. The results showed CMV pneumonitis by pathology and immunostaining. IVIG and intravenous ganciclovir were started. Patient had significant clinical improvement and she was weaned off oxygen. The treatment was continued for a total of 3 weeks. Because of recurrent sinusitis the hospitalist consulted immunology for immunodeficiency evaluation. She was found to have low IgG and IgM and poor response to immunizations, diagnosing her with common variable immunodeficiency (CVID). Outpatient follow‐up evidenced resolution of her symptoms. CVID is a primary immunodeficiency disorder characterized by impaired B‐cell differentiation with defective immunoglobulin production. It is the most prevalent form of severe antibody deficiency affecting both children and adults. The B‐cell dysfunction in CVID leads to increase frequency of bacterial infections, especially sinopulmonary infections. T‐cell dysfunction is variable in patients with CVID. Unusual or opportunistic infections due to viral and fungal pathogens are very uncommon. CMV pneumonitis is usually seen in patients with T‐cell dysfunction; such as HIV infection and transplant patients. The tree‐in‐bud radiographic pattern is frequent in cases of CMV pneumonitis. The pathologic basis for this pattern is an active bronchiolitis with inflammatory cells in the walls of distal airways together with inflammatory exudates and mucus impacting the lumen of the bronchioles. BAL culture or PCR are not specific tests for CMV pneumonitis. Biopsy and pathology sample analysis are likely to be more specific for CMV pneumonitis. Immunoglobulin replacement therapy reduces the number of infections and decreases antibiotic use and hospitalizations in patients with CVID. CVID is a primary B‐cell disorder with frequent bacterial infections. CMV infection is frequent in disorders with T‐cell dysfunction. CMV in CVID is very rare. This was the most important reason why the hospitalist consulted immunology pursuing a correct diagnosis, trying to exhaust all the possible resources to get the diagnosis in this complicated and unusual case. Because a proper diagnosis was made, immunoglobulin replacement therapy was started reducing the number of infections and improving this patient's quality of life. 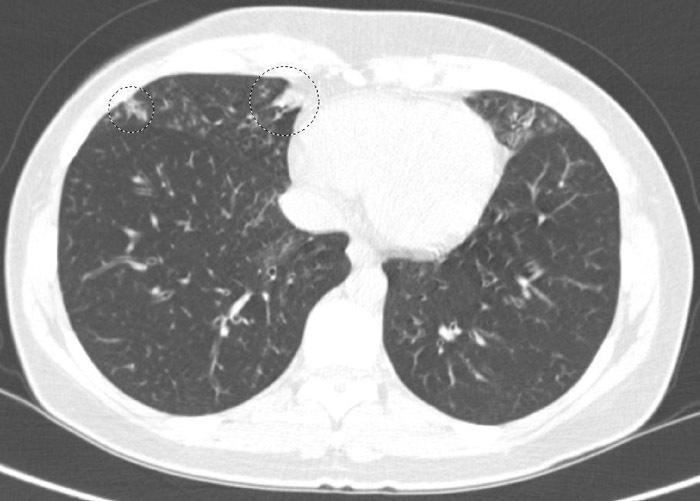 Figure 1.Patient's chest CT scan showing tree‐in‐bud pattern compatible with a CMV pneumonitis along with small areas of confluent opacity noted within the right middle and lingular lobes. Coexistent mild bronchiectasis and bronchial wall thickening is present within the affected areas. Figure 2.Correlation between the tree‐in‐bud radiographic pattern with CMV pneumonitis histopathology. Tree in bud opacities (arrows) are caused by is an active bronchiolitis with inflammatory cells in the walls of distal airways together with inflammatory exudates and mucus impacting the lumen of the bronchioles. The biopsy showed mononuclear infiltrates, mild edema, and pneumocyte hyperplasia. Infected cells are generally large with a prominent basophilic nuclear inclusion (arrow), often with a clear halo. Aguilar‐Aragon J. An Unusual Case of Cmv Pneumonitis That Led to the Diagnosis of an Unexpected Immunodeficiency. Abstract published at Hospital Medicine 2013, May 16-19, National Harbor, Md. Abstract 234. Journal of Hospital Medicine. 2013; 8 (suppl 2). https://www.shmabstracts.com/abstract/an-unusual-case-of-cmv-pneumonitis-that-led-to-the-diagnosis-of-an-unexpected-immunodeficiency/. Accessed April 21, 2019.